"I was on the 12 days Cambodia Explorer with Gun and Sammy. Gun is a fantastic guy...."
"Everything ran like clockwork! Arrivals and departures for day tours were on time,..."
"Trip was super fun and tour guide was very informative and knowledgeable about all..."
"A great tour but really only 4 days. Both guides were great. Tour group small so..."
"It was the most interesting tour I've done so far! Thanks to Kim :)"
"Absolutely brilliant tour. This was my first tour with Intro Travel and I can genuinely..."
"Guide was really good, very attentive to our needs and flexible. He wanted to know..."
"I booked this tour through Travelzoo and My Adventure Store and got an amazing deal..."
"Once we met up with the tour group, things went very well. We had just had a great..."
"Thank you Busabout and Ryan for an amazing trip! I am so happy with how well organised..."
"Could have done with a little more 'down time' with the trip perhaps being a day..."
"Cycling Cambodia was a fantastic adventure. Not only did we go off the beaten track,..."
"It was brilliant our guide was amazing just wish for a few extra hours free time..."
"Highly recommend Social Cycles tour. Very well organised yet still really fun. Beautiful..."
"Having been a TruTraveller already, and part of the TruFam; it was a no brainer to..."
"Thoroughly enjoyed my tour with this company! Great accomodation, food, only glitch..."
"Really feel like I saw the Best of Cambodia. Beautiful country with amazing people...."
"First time using this company and would definitely use again, nice quality central..."
"The tour was amazing. 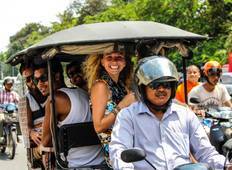 The itinerary was perfect, we experienced the best of Cambodia..."
"Had an absolutely incredible time in Cambodia. From learning about the amazing history..."